ZOYA ULTRABRITES can be worn alone in their natural satin finish or topped with ZOYA ARMOR topcoat or Zoya Naked Manicure Glossy Seal for a high shine finish. Apply over white nail polish (Zoya Purity) to add extra pop to your color! 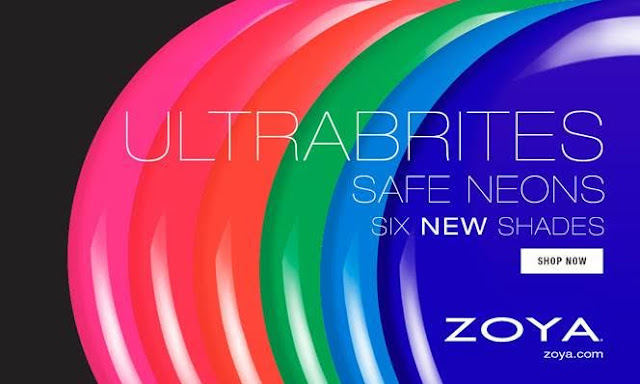 Cana - ZP865: Zoya Cana is a bright neon fuchsia cream. Bisca - ZP866: Zoya Bisca is a hot pink neon cream. Evergreen - ZP868: Zoya Evergreen is an electric green neon cream. Juvia - ZP869: Zoya Juvia is a summery teal neon cream. Mirajane - ZP870: Zoya Mirajane is a classic navy neon cream.